The seventeenth of December 1903 was an ordinary day for JCH Ellehammer, a middle-aged watchmaker from Denmark. Despite his keen interest in engines and his private little experiments with flying machines, he had never heard of Orville and Wilbur Wright before. The brothers’ exploits in Kitty Hawk, North Carolina – in which they managed to lift their engine-driven, heavier-than-air ‘Flyer 1’ into the sky for 12 seconds, travelling a distance of 36.5 metres, to record the first controlled and sustained flight made by a powered aeroplane in the history of mankind – were lost on Ellehammer. As far as he was concerned, he was still in the running to become the first person to fly, and his experiments continued in earnest. After all, the Wrights may have just laid down a groundbreaking milestone in the field of aeronautics, but it did not create much public excitement, which meant that when Ellehammer left the ground in his self-constructed aircraft three years later, he thought he was the first in the world to fly. In reality, he was the first in Europe. And in similar fashion to how Ellehammer overlooked the achievements of the Wrights, Danish contributions to the early history of aviation are often forgotten. Ellehammer, and then Alfred Christian Nervø and Robert Svendsen, would ensure that Denmark was an early pioneer when it comes to flying. Jacob Christian Hansen Ellehammer was born in Bakkebølle at the very southern tip of Zealand in 1871. As an apprenticed watchmaker and electronic engineer with an extensive knowledge of miniature devices, the principles of electricity and internal combustion engines, he was able to calculate the horsepower required to fly based solely on his observations of birds. Ellehammer applied his findings to his self-invented design for a radial engine. Fitted into a semi-biplane, this engine would take him on the first ‘sustained’ flight made by a European. On 12 September 1906 he took off on the tiny island of Lindholm and covered a 42-metre distance whilst travelling 50 cm above the ground. But it went unpublicised, and two months later in November, the title of ‘first to fly in Europe’ was claimed by Alberto Santos-Dumont of Brazil, who piloted a kite-like contraption in front of a public audience on the outskirts of Paris and was hailed as the inventor of the aeroplane all over Europe. Nevertheless, two years later Ellehammer established a reputation for himself when he piloted the ‘Ellehammer IV’, the first aircraft to be flown in Germany, and he continued to play an active role in the development of European aviation until his death in 1946. He was particularly prolific in the area of rotating blades: in 1912, his self-constructed helicopter rose from the ground, and he also invested a motorised saw to use on pigs in a slaughterhouse. Until he witnessed Ellehammer’s first experiments with aeroplanes, fellow countryman Alfred Christian Nervø had been an automobile and racing car enthusiast. Born in Copenhagen in 1879, this son of a restaurant owner worked as a sports journalist for Politiken for most of his career. 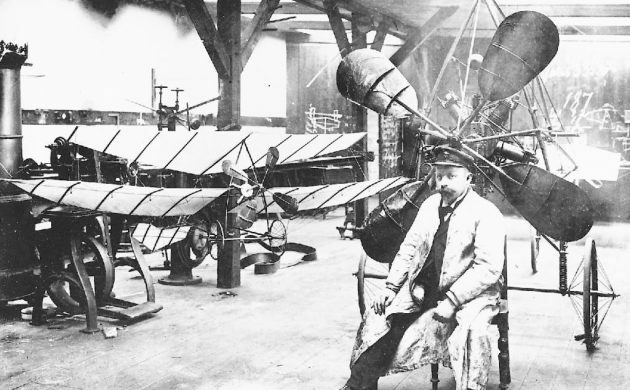 After watching Ellehammer’s experiments in 1905 he became so fascinated in aviation that he bought himself a plane and enrolled in Mourmelon’s flight school in France. After obtaining an international pilot’s licence in early 1910, Nervø attempted his first flights at Kløvermarken, Copenhagen’s first airport, before embarking on his most famous journey – circling around the Rådhustårnet on 3 June 1910. At Mourmelon’s, Nervø met another aspiring pilot from Denmark by the name of Robert Svendsen, who would revolutionise aviation within his first half-year as a pilot. Not only did Svendsen set a new altitude record by flying 84 metres above Kløvermarken on January 5, but he also became the first Dane to receive an international pilot’s licence ten days later. And then on July 3, he became the first Scandinavian pilot to ever fly a passenger. For his next record, Svendsen decided to try what no-one had ever attempted before: crossing the Øresund between Denmark and Sweden by plane. Starting again at Kløvermarken, he was witnessed landing south of Malmö in Limhamn on 16 July 1910, only four years after Ellehammer had made his first short hop on Lindholm. It was mainly due to Svendsen that Denmark was able to maintain its reputation as one of the leading countries in aviation during that decade. In 1911, the ‘youngster’ became the first to pilot a postal flight within Scandinavia in addition to winning 1,000 kroner for a 35-minute flight that covered a distance of 40 km. The Danish military also profited from Svendsen’s extensive experience flying ‘Glenten’, a Dania plane he reconstructed that was used as the country’s first military plane by the air force’s flight school between 1912 and 1913. But after several decades of development, the air force was grounded between 1940 and 1945 by the Nazi occupation, thus losing significant ground on countries actively involved in World War II and constantly innovating to get ahead. By the time Denmark re-established its air force, introducing new planes and technology, it was playing catch-up using personnel with little experience flying and maintaining aircraft. It was hardly surprising, therefore, that Danish planes – military, commercial and private – were involved in a number of crashes in the 1950s, particularly given the overcrowded airspace in the wake of the war. Nevertheless, none of the incidents came close to matching the death toll of the worst crash in Danish aviation history. On 8 October 2001 at Linate Airport in Milan, Copenhagen-bound Scandinavian Airlines Flight 686 collided with a business jet during take-off, killing all 110 people on board and 118 in total. Some 19 were Danes, along with 58 Italians, 20 Swedes and nine other Nordic nationals. The accident was blamed on thick fog together with inadequate safety systems, standards, and procedures at the airport. The disaster is not only the deadliest in Danish aviation history, but also in Italy’s. It took the record from Partnair Flight 394, a Norwegian charter that crashed into the Skagerrak on its way from Oslo to Hamburg on 8 September 1989, killing 50 passengers and five crew members. It is presumed the crash was caused by mechanical failure and poor maintenance. All of the passengers were employees of a shipping company on their way to participate in the launching of a new ship. Oslo was also involved in the third most deadly crash, when Hungarian Flight MA731 on 28 August 1971 departed from the Norwegian capital for Copenhagen and flew into a rain shower 8 km from the Danish coast. The storm caused strong clutter on the radar screen so severe that any contact with air traffic control became impossible. A sudden loss of control of the aircraft during its landing approach to Copenhagen Airport forced it into a steep descent, and it hit the water and broke up. Only three out of the 34 passengers survived, although one of them died three days later. Also at Copenhagen Airport, some 14 years earlier, Soviet plane CCCP-L1874, flying from Moscow to Kastrup, crashed into a chimney of the HC Ørstedsværket power station in Sydhavnen during its approach. Some 23 passengers and five crew members died. The accidents led to the country establishing an organisation to investigate aircraft incidents in 1979. AAIB, the Danish aircraft accident investigation board, was then replaced by AIB in 2004, which is responsible for all airspace over Denmark, Greenland and the Faroe Islands. Just 98 years earlier, Ellehammer had been conducting backyard experiments. How he would have marvelled how far aviation had advanced.